Lions and tigers and zebras, oh my! With an occasional giraffe and leopard, they fill the walls of a spacious home studio in Littleton's Grant Ranch.
" I love vibrant colors and high contrast therefore, I particularly enjoy painting zebras, tigers and giraffes. The strength of my paintings lies in solid rhythmical patterns translated from nature," said Littleton watercolorist Francesca Owens. "I'm trying to find my voice as a painter." She has found a strong, sure voice. 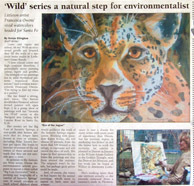 The former stockbroker/financial advisor turned painter will open Sept. 2 in a group show of paintings with her "Animals Are Wild" series at the Marigold Arts Gallery, 424 Canyon Road in Santa Fe, N.M.
proposes to mount a show called "Extricated Wild Cats," with a painting and biography of a number of Serenity Springs' cats. It would circulate to teach school children about the plight of these animals. It would publicize the work of the Serenity Springs organization. Working with president Karen Sculac, she will choose 10 animals, from the more than 100 housed at the refuge, to represent and will record the story of each. She hopes to find sponsorship to frame the paintings and ship them around the country. The originals won't be for sale, but perhaps giclé prints could be made. And, of course, she wants to find buyers for the animal paintings, which seem to appeal to both men and women. Canyon Road gallery space is just a dream for many artists with more years of experience than Owens, but her previous degree in marketing has kicked in and she knows how to work the territory. An exhibit is planned in Denver in January at the Wilson-Adams Gallery in the Golden Triangle, near the Denver Art Museum, and her work can be found at Willow in downtown Littleton. She's working more than one territory actually - she recently returned from a summer's study in Florence, Italy, where she lined up a May 2006 show, followed by June in Cortona (the "Under the Tuscan Sun" town), where she plans to spend next summer painting the Tuscan countryside. A July show in Sorrento is also planned and she's negotiating to take the “Extricated Wild Cats” to Paris at some point in the summer. Italian art critic Edo Barzagli wrote of her pictorial ability, the richness of her colors and the strength and poetic quality of her paintings. She contacted the Smithsonian traveling exhibition department, where proposal coordinator Stephanie Johnson commented: "When Francesca presented me with her Animals are Wild series, I was taken aback by the vibrancy of colors that jumped off the prints. The combination of color variance made the tigers and zebras appear surreal ... I just love your animals. They speak to me." About her distinctive technique, she says she works from photographs and real life. She blows up photos to a size where the stripes fall into patterns, then studies them bringing color theory into play and decides her strategy for a given painting. Her study of color theory was with well-known Colorado painter Steve Quiller, who lives and has a gallery in Creede. She continues to study at Metropolitan State, working on a B.A. in the individualized studies program, with a minor in studio art. In her neighborhood, she serves as a board member of the Bowles Metropolitan District and was responsible for setting off a wildlife habitat for the rookery of great blue herons who inhabit an isthmus of land by a lake - the Isthmus Nature Park and Learning Garden. For more about Francesca Owens, visit www.francescaowens.com.